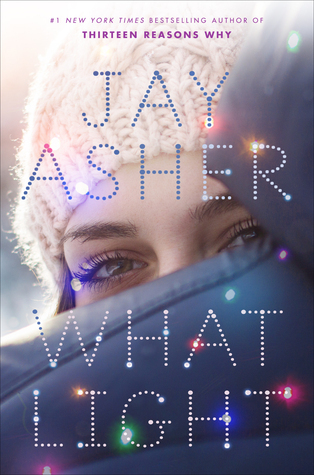 Like most of What Light's readers I come from Thirteen Reasons Why in hopes for something amazing. I think that Jay Asher is a gifted storyteller and definitely has a way with making us feel the feels. I liked this book. I didn't love it. It wasn't something that I stayed up all night reading, but it held my attention and absolutely gave me some feels. Sierra's family travels to California each year to sell their Christmas trees. Their routine is pretty safe. They see the same people, have the same friends and customers. Until one day, Caleb shows up. Immediately everyone's feathers are ruffled because Sierra seems interested and Caleb has a "dark past". I feel like the way that Sierra and Caleb start their relationship is cute and sweet. Caleb visits the lot because he buys trees for families who can't afford them and then delivers them to the families. While he does hide his past from Sierra for a while (a few days), he does end up coming clean with her. Caleb is an outcast because of what he did, but Sierra sees more in him than that. Sierra, of course, does fall into the typical teenage girl category. She's stubborn and wants everyone to like Caleb as much as she does. She doesn't seem to think that his past is a problem: she trusts him. There were a few too-sweet moments and some bouts of teenage angst, but all-in-all I enjoyed this story. I feel like the characters grew with each other in the short time I got to spend with them. Sierra might have been a little bit selfish at times, but she truly believed in Caleb and wanted to make life better for him. This was a sweet story. It wasn't as heart-gripping as Thirteen Reasons Why, but not every story is like that. Check if out if you like a little bit of fluff.